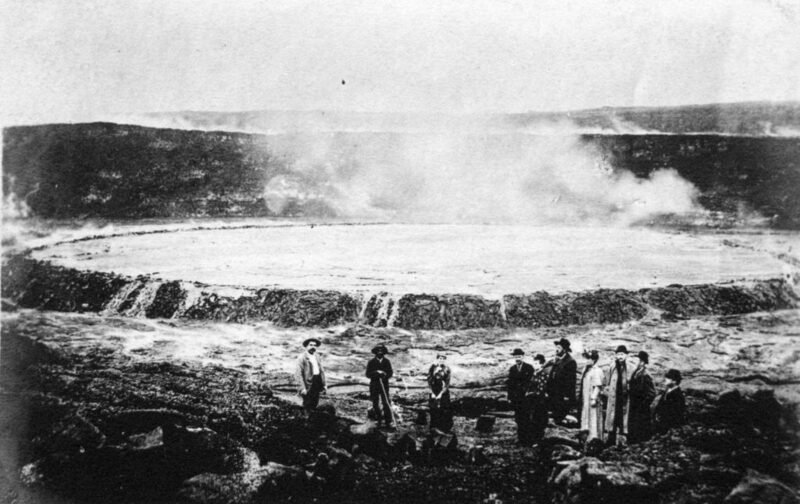 Crater of Kilauea and Dana Lake, early 1890s. Among the people in the photograph are businessman and restauranteur Demosentheses Lycurgus, instrumental in development of tourism in Hawai’i; and entrepreneur John Stephens, also a promoter of the Volcanoes National Park who while serving as United States Minister to the Hawaiian Kingdom became a central conspirator against the Hawaiian monarchy, which was overthrown in 1893 (Hawai’i State Archives PP113-3). Flash to family and friends: Don’t worry. This is not where we will be going on our trip this weekend. Promise. The recent eruptions and lava flows which took place through much of 2018 have subsided almost totally over the last couple of months, and by late September most of the trails, roads, accommodations and other services in the National Park were back up and running again. The famous red glow coming out of the Kilauea caldera is however by all reports gone, the lake of lava at the bottom of Kilauea having been almost completely drained. When we heard of the Park’s reopening we were so delighted that things have settled down geologically speaking, because our hope since the inception of our domestic study away planning was to finish the semester with a capstone experience on Hawai’i, the “Big Island.” The Big Island is a place of rich natural diversity and of historical and archaeological sites such as for example, Pu’uhonua O Honaunau, a designated “place of refuge” on the southwest coast. Historically, someone in trouble with the authorities would be granted refuge if they could reach a Pu’uhonua before being caught by their pursuers. The nature of the alleged breaking of kapu or crime was immaterial; if you made it to a Pu’uhonua you were granted protection and, in addition, a path to rehabilitation and reentry into the community. Ali’i of high status could also in their person constitute a Pu’uhonua, so that someone on the run could gain protection by reaching that person. We will be visiting the Pu’uhonua of the ahapua’a of Honaunau (see the discussion of ahapua’a in Blog #1), one of the few remaining fairly complete remains of a Pu’uhonua, which used to exist in every moku or district on the island (to get an overview of how such a refuge worked and made cultural sense, look into the Hawaiian system of conflict resolution called Ho’oponopono, “to make right”). While on the Big Island we will be staying at the Kilauea Military Camp, which has served as an R&R facility for American military since approx. 1916 and also is sometimes available to groups like ours which do not have a military affiliation. We have arranged to have local experts give us guided talks; one which is organized by the Volcano Art Center will be a walk through the local rainforest in which the Park is situated; another “Sulfur and Steam”, will address the geology of the area; and we will have an historical talk by a retired archivist and librarian who has researched the role played by the African American “Buffalo Soldiers” (an unfortunately little known history) in the building of the US national park system in general and specifically the building of a 20 mile trail and rest house by a company of the Buffalo Soldiers, built in 1916 to the summit of Mauna Loa, over 13,000 feet, in a particularly wet rainy season. The Big Island is embroiled in a clash of concepts of sacred space with the desires of astronomers and their educational and governmental institutions to have the biggest and best when it comes to technology. Must one priority override the other? The height of the mountains and the clarity of the night sky has for the last several decades led consortiums from many countries to install dozens of telescopes on Mauna Kea and has led to huge controversy. On the table for consideration now is a proposal by scientific institutions to get approval for the biggest telescope ever to be build on Mauna Kea mountain, with a lens of 30 metres. Proponents have offered to remove several older and smaller telescopes; many local people and cultural activists are not buying it. After years of litigation, just last month (October 2018) the state Supreme Court ruled 4 to 1 in favor of granting building permits. Then last week (21 November 2018), opponents requested the Supreme Court to reconsider its decision. Another forum in which disagreements about telescopes vs. sacred land are being presented and mediated is the museum of the ‘Imiloa astronomy center in Hilo. The museum’s presentation of history and philosophy (funded by grants from consortia of astronomers) places “Western” astronomical ideas side by side with a Hawaiian philosophical view about the heavens, arguing their compatibility. A visit to the museum might be doable on our way to a very fine Hawaiian lunch restaurant we’d like to take the students.